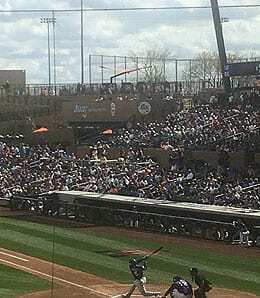 Our good friends, Tonia Desiato and Manny Santos, recently made pilgrimage with their kids to the Cactus League in Arizona to take in eight Spring Training games over March Break. Here is the photographic evidence with commentary by RotoRob. Corey Seager took a bit of a step back last year. Corey Seager, once the unanimous top prospect in the game, enters his third full season in 2018. Last year didn’t go quite as well as his historic rookie effort in 2016, but there were still some areas of growth, specifically in his walk rate and an increase in steals (although this is unlikely to ever be something he’s going to excel at). Seager is learning to become a consummate pro with the help of double play partner Chase Utley, who apparently has had a big influence on the youngster. Expect Seager to again top 20 homers and flirt with a .300 average. 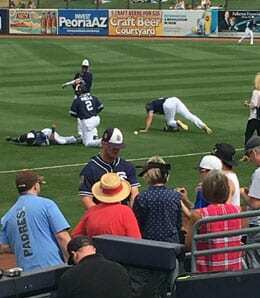 Wil Myers signed a ball for Tonia’s son Simon. After dealing with some major injury issues early in his career, Wil Myers has finally managed to stay healthy the last two seasons. He had a so-so campaign last year, showing modest growth in some areas, but regression in others. However, the addition of Eric Hosmer to the Padre lineup this season should affect Myers in multiple ways. First off, Myers will return to the outfield after spending virtually all his time at first base last year. Second, and more important, Myers should see a boost in his numbers with the lineup protection Hosmer will provide. After back-to-back seasons of at least 25 homers and 20 steals, Myers may add a better BA to that combo this year, which will massively increase his value. 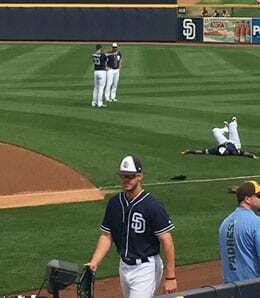 Wil Myers needs to improve his Petco numbers. Myers’ run total should bounce back with an improved Padre lineup this season. He remains under contract to San Diego until 2022, with the team holding a 2023 option on him, so it would be nice to see him improve on his Petco Park numbers (an OPS of just 739 last year). Back in right field this season, Myers is expected to bat third after spending most of his time in the two-hole last year. Buster Posey hopes to stay healthy this week. San Francisco Giants catcher Buster Posey dealt with some minor injuries last year that limited him to his fewest games since 2011. Even so, he continues to flash plenty of extra-base pop and remains one of the top producing catchers in the game. 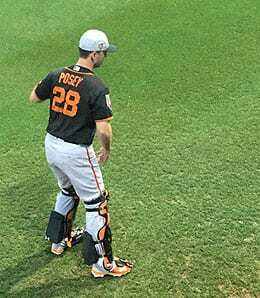 An ankle woe slowed Posey for a couple of weeks this spring, but he’ll be perfectly fine once the games start for real this week. 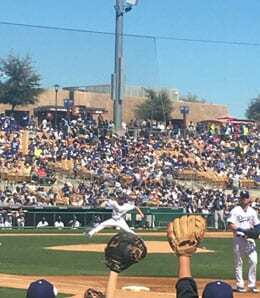 Clayton Kershaw remains the top arm in the game. Clayton Kershaw, the Dodgers’ first round pick in 2006, has spent the past few seasons establishing himself as the game’s top starting pitcher. His resume is impressive: Kershaw has been named to each of the last seven NL All-Star teams, has won three Cy Young Awards, was the 2014 NL MVP, is an eight-time Player of the Week winner and six-time Pitcher of the Month honouree, and was named MLB’s Most Valuable Player in the 2014 Gibbys. Last year, he failed to throw a shutout for the first time since 2009, but he was healthier than he was in 2016, reaching 175 IP for the seventh time in his career. Having just turned 30, Kershaw has a lot of mileage on his left arm, but he remains the ace of a rotation that lacks the depth we saw last year. Buster Posey’s pop has waned. Despite continued regression in his ISO, Posey can still rake with the best of them, batting .320 last year, for his highest mark since his monster 2012 season. The hits may not find their way over the fence as often as they used to, but they still come very frequently. Is there a better pure hitting catcher in the game today? Not for our money. 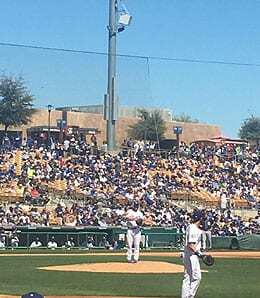 Clayton Kershaw finally pitched at Triple-A last year. En route to the major leagues, Kershaw never pitched in Triple-A. In fact, it wasn’t until an injury rehab start last year that he had his first taste of that level. If not for his back woe, Kershaw seemed well on his way to a fourth Cy Young trophy. Prior to getting hurt, he was sitting pretty at 15-2 with an MLB-leading 2.04 ERA and 168 Ks in 141 1/3 IP. The past few seasons, Kershaw’s health has become a concern, and that’s something to monitor very closely this year. Buster Posey remains an OBP force. One of the other allures of Posey is that he remains an especially valuable asset in OBP leagues. Last year, he reached the .400 mark for just the second time in his career. Posey is no spring chicken but with impact catching prospects few and far between, landing him as your Fantasy catcher remains one of the smarter plays owners can make. He will almost assuredly bat .300 (or damn close) and should put up an OPS well over 800 again this season. Buster Posey has been amazingly consistent. With six straight seasons recording a WAR of 4.0 or higher, Posey has been the model of consistency. In theory, the additions of Evan Longoria and Andrew McCutchen will make the Giants’ lineup pretty much as strong as it’s been since Posey reached the majors. In theory, we repeat. 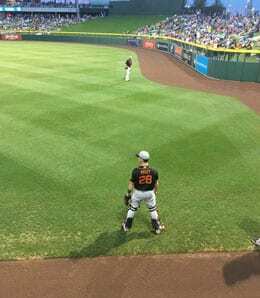 Either way, as a player that will also qualify at first base (we slotted him in the top 10 at first base in 2016, but he failed to qualify there in some leagues), Posey provides even greater flexibility. Of course, unless you own Gary Sanchez or possibly Willson Contreras (or have a hole at first base), there’s almost no way you’re using Posey at anything other than catcher. Now it’s your turn. Let us know what you think of these players’ outlook in the comments below. Buy the 2018 Fantasy Baseball Guide online, use promo code Rob18 and save yourself a buck. Do it. Do it now. Mudiay is going to have a size advantage over many PGs, but unless he can drain his shot, it won’t matter much. He’s young and raw, so his shooting woes are nothing some mechanical fixes won’t address. 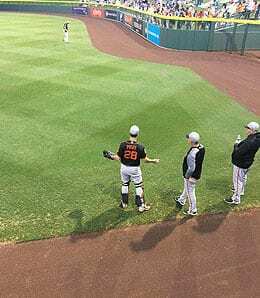 In November, Tim McLeod visited the Arizona Fall League, and while a full scouting report won’t be coming this year, he took some photographs — tons of them in fact. Today, we offer up our final gallery. 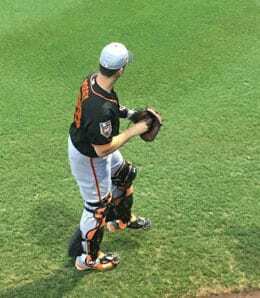 In November, Tim McLeod visited the Arizona Fall League, and while a full scouting report won’t be coming this year, he took some photographs — tons of them in fact. Over the next few weeks, we will unveil our exhaustive collection of images of the top prospects at the AFL. Brandon Maurer managed one win in six AFL starts, but emerged from the prospect showcase with a losing record.